A former Pfizer CEO now sits on ViewRay's board. Henry “Hank” McKinnell Jr. sees a lot of potential in the Oakwood Village, Ohio, company's MRI-guided radiation therapy system, according to a news release issued by ViewRay. “ViewRay's innovative technology brings unprecedented visibility to radiation therapy, and can help countless cancer patients around the world,” he stated in the release. One of ViewRay's board seats recently became open: Robert Weisskoff left the board at the end of March, when ViewRay's stock began trading on the NASDAQ Global Market. McKinnell spent 35 years at Pfizer before retiring in 2006. He became chairman and CEO of the global pharmaceutical company in 2001. He also served as president of Pfizer Asia, president of Pfizer's medical devices group, president of Pfizer Pharmaceuticals Group and chief financial officer, the release stated. McKinnell has plenty of board experience. 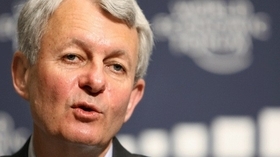 He's currently chairman of Moody's Corp. and Accordia Global Health Foundation. He also has served as a director at ExxonMobil Corp., John Wiley & Sons, Optimer Pharmaceuticals Inc., Emmaus Life Sciences Inc. and Angiotech Pharmaceuticals Inc.
ViewRay CEO Chris Raanes said he's “delighted” to have McKinnell as a board member. “Hank's vast experience in medical innovation, in running a business, and in working with governments and other key stakeholders will be invaluable as we take ViewRay to the next level,” Raanes stated in the release. "Former Pfizer CEO Henry McKinnell Jr. joins ViewRay's board" originally appeared on the website of Crain's Cleveland Business.